Its’ been long since people have seen Mithun da dancing on screen. But who can forget this Disco dancer of the past. Remember the man who made the youth dance along with him with his super hit song, ‘I am a disco dancer’ long ago. Well fans of Mithun can see him dancing again in the film ‘Chal Chalein’. An unusual subject of children committing suicide due to severe depression forms the basic theme of the film. The film will be directed by Ujjwal singh, produced by Valiant entertainment pvt ltd, written by Vijaya, and music given by the evergreen illayraja. Yesteryear’s actor Manoj Kumar also acts in the movie after 12 years. 10 child actors selected from various serials and popular ad films along with Kawaljeet,Darshan Zariwala and Rati Agnihotri forms the star cast of the movie. Welcome back to Bollywood Dancing, Mithun. which discuss Mithun Chakraborty's films, upcomming projects, review his work,display movie clips,showcase his lates work . 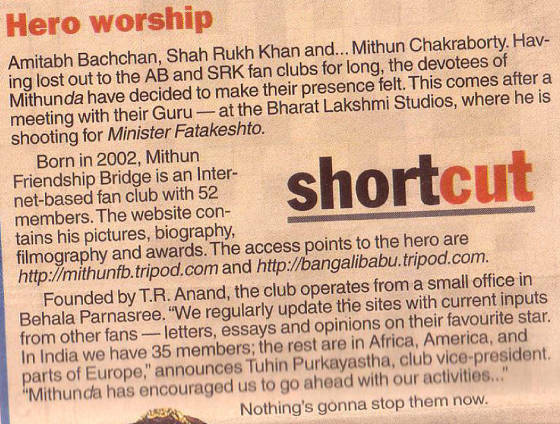 "Mithunda has been supportive of our endeavour and in turn we try to help his social work projects by setting them up online and inviting donations from fans from all over," says Lord , preident of the fan club that is now trying to move beyond the virtual realm. OUR BELOVED ANAND DAA HAS EXPIRED DUE TO HEART ATTACK ON 16.08.07 . GOD MAY BLESS HIM IN THE OUTER WORLD . WE ARE VERY SAD DUE TO THIS REASON AS HE WAS THE MAIN PILLAR OF MFB AS A PRESIDENT & FOUNDER . I am an admirer of your columns published in Screen week after week. Your column titled “Short Takes” does depict the present-day Bollywood in a nutshell with amazing photos. I am an admirer of both Mithun Chakraborty and his son Mimoh. I have met Mithun thriece in my lifetime and am very much impressed with the gentleman that he is. At my last meeting with Mithun during the shoot of his first –ever Bengali sequel titled “Minister Fatakeshto”, the members of MITHUN FRIENDSHIP BRIDGE enjoyed a long discussion. 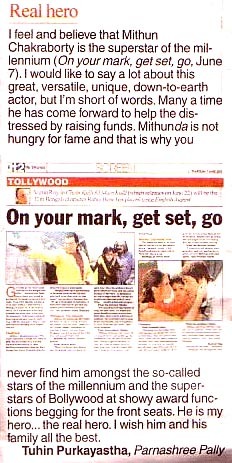 I therefore request your good self to publish some flashes on Mithun and Mimoh in yoru most popular column. Hope you will satisfy Mithun fans all around the globe by doing so.